Domestic Sluttery: Comic Inspiration To Do The Housework! 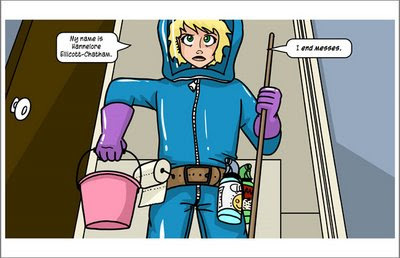 Questionable Content is one of my geeky pleasures and amongst the characters is cleanliness obsessed Hanners. As I'm often fairly loathe to do housework, the print from this comic is a cute way of reminding me that I do need to do it! It's $15 plus shipping from geek shopping heaven Topatoco. I think women definitely do too much housework. Could it be that the standards are too high, or perhaps we have way too much stuff, so that more and more housework needs to be done.